Figure 14. The respiratory cycle. D. THE EYE AND THE SIGHT SYSTEM. 1. General. The shooter need not concern himself with a scientific knowledge of the eye. He should be concerned only that his eyes are healthy, that he can see clearly, and that he uses his eyes properly while shooting. A layman should never attempt to prescribe or administer treatment to defective or injured eyes. A shooter (or anyone) with eye problems should consult a vision specialist. Corrective lenses in no way impair a shooter's ability. Some of the world's best marksmen shoot with corrected vision. a. A person with no eye defects normally has 20/20 vision. ''Twenty/twenty" does not denote '•perfect11 vision. It is simply an arbitary standard of measurement applied to visual acuity. It denotes the ability to read alphabetical letters 8.7 millimeters high at twenty feet. This constitutes reading letters contained within 5 minutes of angle. There are many cases of individuals being able to read within 3 minutes of angle, and in some cases, within less than 2 minutes of angle. Weak or defective eyes can in most cases be corrected to 20/20 strength by prescription lenses. b. Human eyes are as different from one another as, say, human hands. This is true even of eyes that score 20/20 vision. Some eyes see sight pictures best in brilliant light. Others perform best in soft light. Some eyes have great perception of depth and perspective. Others do not. The list of differing characteristics could be made quite long. The important consideration is that two different people are likely to have different eye characteristics, even if they have 20/20 vision. A particular set of sights that provides maximum clarity to one shooter's eyes may not provide the same clarity to another shooter's eyes. Each shooter must select the components of his sight system to fit the characteristics of his own eyes. This rarely involves the purchase of special equipment. a. Look as straight forward as possible out of the eye socket. If the head position causes the shooter to look across the bridge of hie nose or out from under his eyebrow, the eye muscles will be strained. This strain will produce Involuntary eye movements which reduce the reliability of vision. This will not only affect performance, but the inability to see well will also have a damaging psychological effect upon the shooter (see Chapter II, COACHING). The eyes will function best in their natural, forward-looking position. b. Do not fix vision on the sight picture for more than several seconds. When the eyes are focused on a single image for a time, the image is "burned11 into the area of perception. This cffect upon the shooter's eyes is quite important, A burned in sight picture will dull acuity in the critical area of perception; and this image may possibly be mistaken for a true sight picture. Either effect will seriously damage performance. c. Normally the best use of the eyes is derived when the shooter keeps both eyes open while firing. It is natural for the eyes to work as a refined team. If one eye is squinted or closed the other eye will have a tendency to want to do the same, With both eyes open the shooter also finds it easier to check the wind flags on the range while the rifle is in the aiming position. d. On occasion there will be a shooter whose aiming eye is not his dominant eye. In this case it might prove helpful to use a blinder. In fact, most shooters do use a blinder regardless of their dominant eye. This tends to decrease visual distractions and increase concentration. Side lighting may also be distracting to the shooter under some light conditions. If harsh light becomes annoying, a blinder may be used here again. Such a blinder may be attached to the shooting glasses or hat brim. The preferred blinder is one that is attached to the rifle in the vicinity of the rear sight. In this manner, the left eye will remain open but the blinder will block out the view down range. 4. Focus of the Eye. a. Many shooters contend that the shooter should focus his shooting eye on the front sight; that seeing the front sight or aperture clearly and distinctly is the most important visual aspect in sighting, This is not necessarily true. Most shooters have the capability of seeing both the front and target bull with equal clarity. This capability is referred to as "accommodation. 11 When aiming the shooters eye is continuously changing focus from the front sight to the target and back to the front sight. The eye focuses back and forth so rapidly that it appears to the shooter that both images are seen with equal clarity. b. However, after the age of 40-45 years the eye muscles lose their ability to flick back and forth at the rapid rate required to accommodate both the front sight and target bull. In such a case focus should be concentrated on the front aperture to obtain optimum results in sighting. This will result in the target being somewhat out of focus. c. Accommodation and visual clarity can be improved by the use of a small rear aperture. A small rear aperture will increase depth of field, enhance accommodation and actually increase visual acuity. ,For this advantage to be realized the rear aperture must be smaller than the pupil of the eye. The smaller the rear aperture the greater.the depth of field and the greater the visual acuity becomes. There is however, a point of diminishing returns regarding aperture size. When rear aperture-size becomee less than approximately one millimeter an inadequate amount of light reaches the eye and vision becomes noticeably poorer. a. Proper sight alignment can be defined as the process of perfectly centering the front sight in the rear aperture. b. Sight picture contains the same two elements of sight alignment (front and rear sights) with the addition of the bull or target image. A perfect sight picture exists when the sights are properly aligned and the bullseye centered in the front aperture or properly positioned on the post. 6. 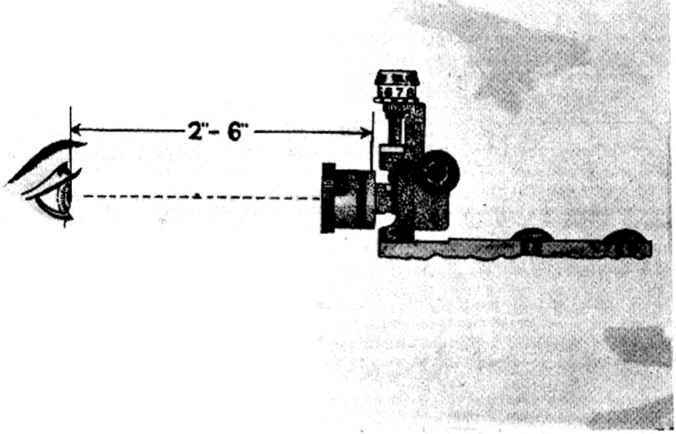 The Front Sight: The universally accepted front sight consists of a tublar mount containing a removable insert (Figure IS). The most frequently used inserts are the post and the aperture. a. The Aperture: The aperture is the more popular insert. The most common error is the use of an aperture that is too small. Generally speaking, the diameter of the aperture should appear to be about 1-11/2 times the diameter of the target black. However, this is only a guide. The optimum size aperture is the one that reveals a wide line of white around the bull's-eye and allows the target to stand out in clear definition against this white background. The optimum size will change under different conditions of light. An aperture selected under one light condition might under a different light, form a blur around the target or make the target appear indistinct or oblong. A different aperture size will help to correct these aberrations. Each shooter must select the aperture size that meets the requirements of his own eyes under the prevailing light conditions. Figure 15. Front and rear sights with adjustable rear aperture. c, The Disc: The disc insert has become popular with some shooters. The insert consists of a clear or transluscent plastic disc with a center aperture. These discs come in various colors. The disc should conform to the same general standards applied to the metallic aperture. The opening in the disc should be round, clearly defined and easily visible. It should reveal a maximum contrast of the target black against the background. If a shooter prefers a disc aperture and achieves good results with one, there is no reason why he should not use it, d. Combinations of Inserts: There is no indication that combinations of the above sight inserts contribute to a better mechanical sight system. 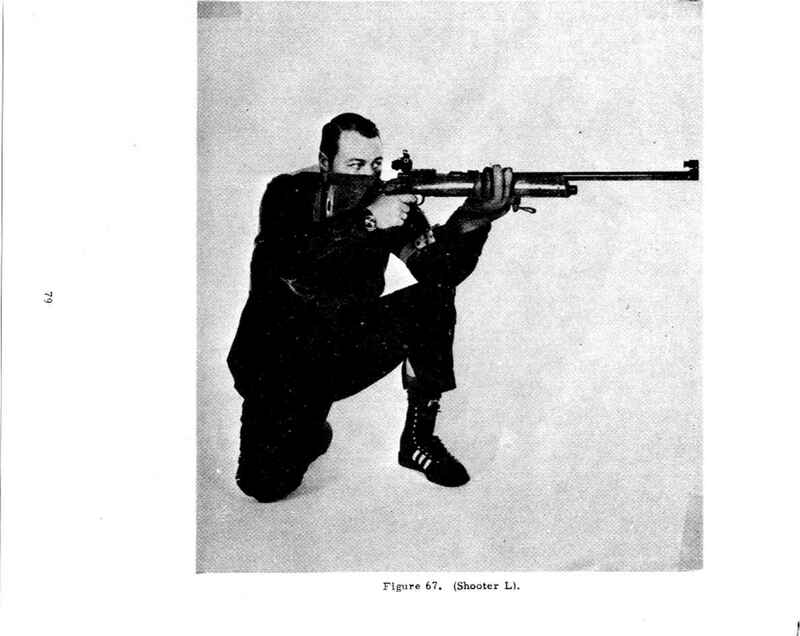 The shooter may use a combination because of prefercncc; but by all Indications, he is only adding to the amount of equipment he must care for and gains nothing in terms of mechanical advantage. 7. The Rear Sight, a# Mechanically, the rear sight should be rugged, tight, and firmly attached. It should be capable of finely graduated adjustments (1/4 or 1/8 minutes of angle). The adjustment mechanism should be free of slack and should move precisely the same distance with each click of adjustment. The sights should be protected at all times, but especially when being transported. b. The rear aperture size should be selected to create a clearly defined sight picture and allow easy sight alignment. c. Most shooters feel that a tight rear aperture (one that allows only a narrow line of white to be visible around the front sight hood) provides for the easiest sight alignment. Slight deviations in alignment are easily noticeable, and sight alignment becomes practically automatic. This line of white around the front sight hood can also be varied by increasing or decreasing the eye relief. d. Some shooters prefer a large rear aperture (one that allows a wide line of white to be visible around the front sight hood). The large aperture can produce good results. However, because of the large area visible around the front sight, misalignment of the sights is less noticcable. The shooter must therefore consciously watch for errors in alignment. The tight aperture takes greater advantage of the mechanical system in providing for easy alignment. e. The most important consideration in choosing a rear aperture is visual clarity. By adjusting the size of the rear aperture, the shooter can control the amount of light entering the eye. He can thus affect contrast in the sight picture, or contrast between the target black and white background. Strong contrast and sharp, clearly defined edges are desirable. While this is in part controlled by front sight aperture size (but not by post size), the size of the rear aperture is more critical in controlling definition. f. We strongly recommend the use of an adjustable rear aperture (Figure 15). 8. Eye Relief. Eye relief is the distance between the eye and the rear sight (Figure 16). There is no measured distance that is correct eye relief for all shooters. In many cases it is controlled by the construction of the equipment. Eye relief can best be evaluated by these two standards. a. The position of the sight should result in the shooter assuming a natural upright position. The sight should be adjusted to the head position, and not the head position to the sight. The importance of head position is discussed in Chapter rv, INTERRELATED ASPECTS OF POSITION SHOOTING. b. Eye relief should feel comfortable to the shooter. The rear sight should not be so close that the shooter worries about recoil; and it 9hould not be so far from the eye that he must strain to receive a clear sight picture. Some shooters prefer close eye relief, others distant relief. Average eye relief is about 2-6 inches. Each shooter must adjust eye relief to fit his own eye characteristics.